In the 18th century, women’s pockets were not sewn into their gowns. Instead they were attached to a tape and tied around the waist as separate garments. Worn under the hoops and petticoats, they were accessed through openings in the gown and petticoat seams. 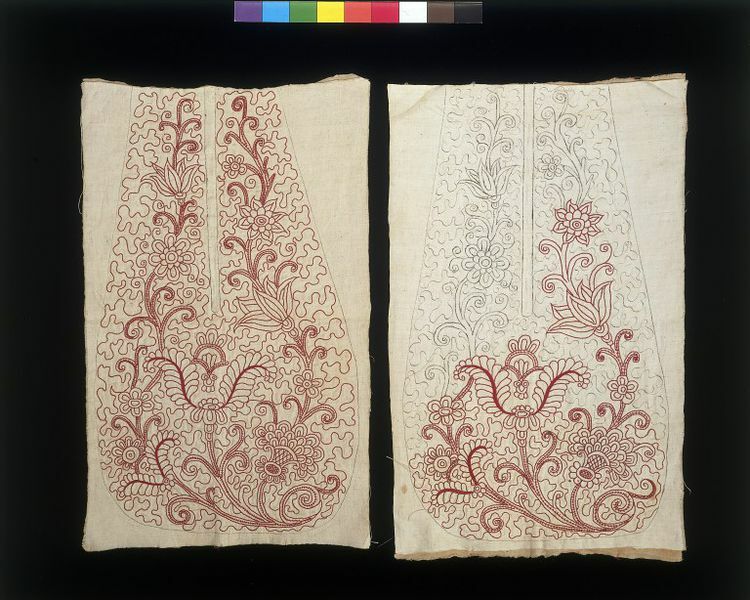 These unfinished pieces of embroidery demonstrate the steps in making pockets. The design is drawn in ink on a piece of linen. The linen is then backed with another piece and set into an embroidery frame for the needlework to be carried out. Once the embroidery is finished, the pocket can be cut out, lined and sewn to the back. Next the edges were are bound and the ties attached. 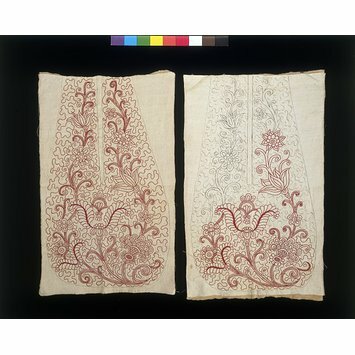 The embroidery pattern on this pocket is the same as its pair, and probably drawn free hand. The large floral motifs with curling leaves and petals echo woven silk designs from the period 1710–1720. This pocket forms part of the Hannah Downes collection of needlework, executed by four generations of women between the late 17th and 19th centuries in Britain. The family tree identifies Hannah Haines, youngest daughter of Hannah Downes, as the maker of this pocket between 1718-1720. Linen backed with linen and embroidered in red silk thread for pocket fronts. The embroidery pattern incorporates large floral motifs. Given by the descendants of Hannah Downes and part of a collection of needlework executed by four generations of women. The family tree identifies Hannah Haines, youngest daughter of Hannah Downes, as the author of these pocket fronts between 1718-1720. Historical significance: These unfinished pocket fronts illustrate part of the construction process of an 18th century pair of women's pockets.